It’s probably not surprising to anybody who has attended or manages a conference or convention in Las Vegas that our city does it better than anybody. The LVCVA (Las Vegas Convention Center and Visitors Authority) is arguably one of the most experience and discerning organizations running conventions in the United States. As such, they are very particular about who they allow to work with their customers (folks putting on or participating in a conference). 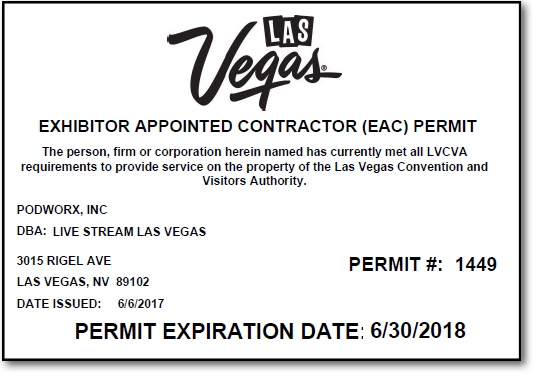 To that end, PodWorx and LIVE STREAM Las Vegas is pleased to share that the LVCVA has extended to us their “Exhibitor Appointed Contractor (EAC) Permit”. 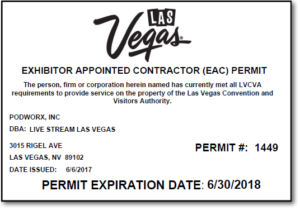 The accreditation is required to provide services on the property of the Las Vegas Convention and Visitors Authority. What’s especially interesting is we are the only company with an EAC Permit solely dedicated to multi-camera, broadcast-quality, live streaming and HD recording.